Residents who were evacuated from their homes due to a mile-long mountain fire have returned home. 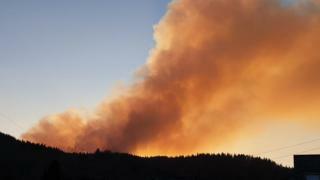 The grass fire in Betws-y-Coed, Conwy county, affected an area of about 100 hectares, the fire service said. North Wales Fire Service said the fire, which was first reported at 16:15 GMT on Friday, had "reduced significantly"
Kevin Roberts, assistant chief fire officer, urged visitors to the countryside to take extra care.